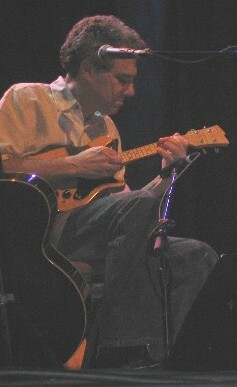 Founder of progressive acoustic band Silk City, Mitterhoff is a widely respected and eclectically diverse mandolinist. Of late he's been playing with Hot Tuna, using electrics by Michael Stevens and Joel Eckhaus. On the left he's playing a borrowed Ryder EM-44. Don't know if he actually uses this Epiphone Mandobird on the right.